The diaphragm electrode method is widely used to measure dissolved oxygen levels. This method uses electrodes to detect the amount of oxygen as it passes through a highly oxygen permeable diaphragm. There are two methods for detecting dissolved oxygen levels by using electrodes: one is the galvanic electrode method and the other is the polarographic method. These methods have both advantages and disadvantages and so the method that best suits the situation is used. Figure 1 shows a schematic diagram of the diaphragm galvanic electrode method. A diaphragm with high oxygen (DO) permeability separates the electrodes and internal solution from the sample solution (a polyethylene or fluororesin membrane is often used as the diaphragm, and recently, the latter is more commonly used). A solution of potassium hydroxide (KOH) is commonly used as the internal solution. While a noble metal is used for the working electrode (Pt, Au, and Ag are often used, but Ag is used most often), a base metal is used for the counter electrode (Pb and Al are often used, but Pb is used more often). Thus, this method has a similar structure to a battery, so when the working electrode and the counter electrode are connected electrically, a current is generated by oxygen reduction. Since this current is proportional to the DO level, the DO level can be calculated by measuring the current with an external ammeter. 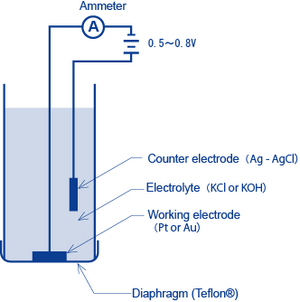 While the working electrode and the counter electrode are connected electrically, a current is naturally generated because of the oxygen, and the oxygen in the internal solution is constantly in a consumed state. Therefore, this system does not require aging to completely consume the oxygen in the internal solution. Like batteries, the internal solution and the electrodes deteriorate with time, which results in a reduction in the strength of the current generated. Thus, this system generally has a shorter life than methods based on other principles. This method uses a highly alkali solution (KOH) as the internal solution and a hazardous heavy metal (Pb) as the counter electrode. As highly alkali solutions affect the skin and eyes, care must be taken when replacing the diaphragm or disposing of the electrodes. Figure 2 shows a schematic diagram of the diaphragm polarographic method. 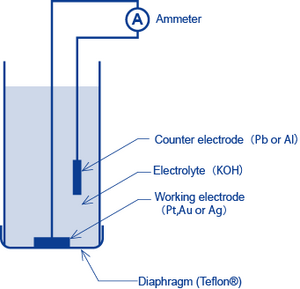 This method is the same as the diaphragm galvanic electrode method in that a diaphragm with high oxygen (DO) permeability separates the electrodes and internal solution from the sample solution (a polyethylene or fluororesin membrane is often used as the diaphragm, and recently, the latter is more commonly used). KCl or KOH is used as the internal solution (neutral KCl is more common as it is easy to handle). While a noble metal is used for the working electrode (Pt or Au), silver-silver chloride is used for the counter electrode (Ag/AgCl produces a constant electric potential proportional to the concentration of the internal solution (KCl)). In the diaphragm polarographic method, the voltage necessary to reduce DO as it passes through the diaphragm is applied between the working electrode and the counter electrode by using an external constant-voltage device. If KCl (with a concentration of approximately 1 mol/L) is used as the internal solution and Ag/AgCl is used as the counter electrode, the electric potential of the counter electrode is not changed by the application of some electrical current. This means that polarization does not occur and a certain voltage is always applied to the working electrode. By applying a certain voltage to the working electrode, a current proportional to the DO level can be applied. 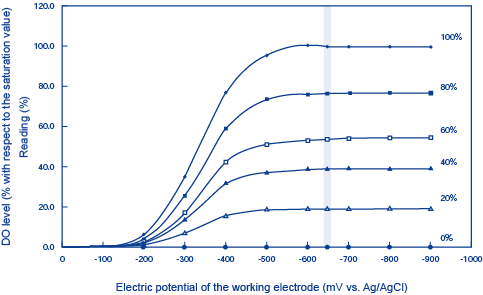 Figure 3 shows the relationship between the measurements of the DO reduction current and the electric potential of the working electrode (mV vs. Ag/AgCl). We apply a voltage of approximately -650 mV vs. Ag/AgCl. This figure shows that a change of tens of millivolts around this voltage level does not affect the DO reduction current observations at all. Since oxygen in the internal solution is not consumed until current is applied, this system generally has a longer life than the system of the diaphragm galvanic electrode method. However, as this method requires that the voltage for reducing oxygen be supplied by an external constant-voltage device, it requires sufficient aging before use.